The Buffalo County Historical Society/Trails and Rails Museum traces the history of transportation through Buffalo County on a site where the Mormon Trail once passed. Displays include a Union Pacific steam engine, an 1898 depot, 1898 church, 1880s Freighters' Hotel, an 1871 school house, and archives of the area. The Museum also house rare photos, diaries, letters, and other archival records used by researchers all over the world. More land has been acquired to the west which will allow the complex to almost double in size. The museum building is the Union Pacific depot, moved from Shelton on the east of Buffalo County. The waiting room and ticket office have been restored to appear as they did when the depot was in use. The baggage room has been converted into an exhibit room showing the history of wagon, train and auto transportation in and through Buffalo County. * District No. 1 School House - Pioneers traveling on the Mormon Trail settled in eastern Buffalo County. They organized the county's first school district and , in 1871, built this school. It was the first frame schoolhouse to be completed in the county. * Loup River Freighters Hotel - This house was built in the 1880s to provide freight wagon drivers a place to stay over night when taking supplies from Kearney to Broken Bow. * Log Cabin - The cabin of the 1860-1870 period on the museum grounds is a fine interpretive exhibit of a structure "like" the one at Post South Loup Fork, and will provide a place to show and tell local history. * 1898 Church - The German-Baptist Mission church which was established in Kearney in 1898 is now a part of the complex. 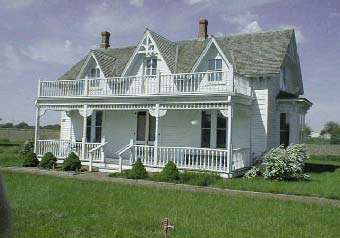 * Boyd Ranch House - This house was the first frame house in Buffalo County. It was built in the late 1850s when it was part of the J.E. Boyd Trail Ranch on the Wood River near Gibbon. The ranch furnished supplies to travelers on the Platte Valley Overland Trails. The Museum also hosts many special events including the Annual Wagons West Day in June and a Christmas Tree Walk in December. Mon - Fri. 1 To 5 , closed weekends.